Since their introduction in 1963, the zero-turn mower has evolved into an ultra-efficient means to tackle yards and landscapes of all sizes. For years, zero-turn mowers have been used by professional landscapers to achieve a manicured look in less time; but today, that technology has become more readily available. Like cars, there are luxury vehicles and economy vehicles, so even a homeowner can purchase and benefit from owning a zero-turn mower. When the turning radius of a mower is close enough to zero inches, the machine has a zero-degree turn radius, allowing it to turn within its own footprint. This is advantageous because it enables easier maneuvering, provides a higher straight-line mowing speed, and lets you mow in a single pass. Those benefits cut mowing time in half by increasing the speed with which you mow and reducing time spent reversing, taking wide turns, or having to go over any spots you missed due to unnecessary maneuvering. A noticeable difference between conventional lawn tractors and a zero-turn mower is how they’re controlled. A traditional mower utilizes a steering wheel, whereas a zero-turn model uses two independent steering controls. For these machines, each rear wheel features an independent wheel motor. 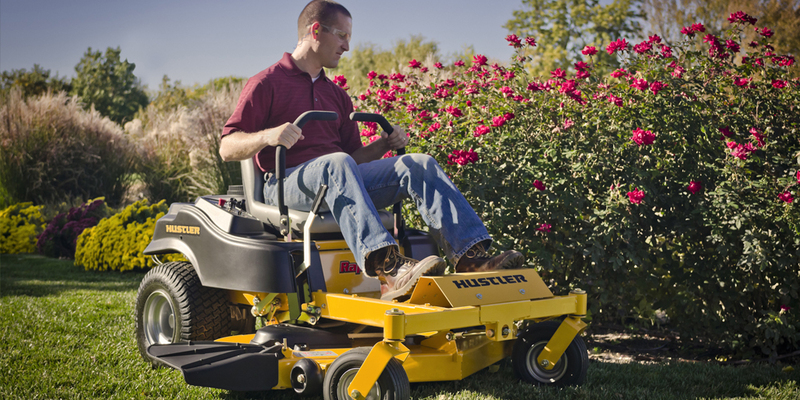 As a side note, remember that zero-turn mowers are ideal for flat terrains. Hills, inclines, and other “undulating” terrain is ill suited for zero-turn machines as they lack a sufficient center of gravity to prevent tipping over. Shopping for a zero-turn mower can seem complicated, but it’s really quite easy when you know what to look for. No matter what, you want to make sure your equipment is sturdy. This comes down to deck construction, frame design—characteristics like the gauge of steel used and whether the deck is stamped. A simple way to differentiate a commercial mower and a residential model is by looking at the deck construction. Commercial decks will be welded pieces of heavy-gauge steel, whereas residential mowers are going to use lighter-gauge steel that’s been stamped in a press. Why does this difference matter? Commercial zero-turn mowers are intended for more rugged landscapes, hence the thicker gauge steel and welded design. If you have rough terrain or just need the mower to withstand the conditions of the space you intend to mow, you want to make sure the deck can handle it. Same goes for how thick the steel is that covers the rear-mounted engine. Thin steel is going to result in less durability, so take not of it when shopping. The number off cylinders your engine has is likely to be reflected in the price tag. Single-cylinder engines are more common in lower priced models, while mid- to top-tier mowers may have twin-cylinder OHB engines. The better the engine, the smoother the run; so if vibration is something you want to avoid, make sure the engine is at least a two-cylinder. Wider tires distribute the mower’s weight over a larger area, which reduces stress on the grass and improves traction. Durable, four-ply-rated tires are ideal in a zero-turn mower since it’s already going to have exceptional maneuverability and speed. As for comfort, you want to make sure it’s not painful to use. Uncomfortable seats can cause back problems, or having to reach for out-of-the-way controls may prohibit the ease with which you mow. Like any piece of lawn equipment, zero-turn mowers can be hugely helpful when you educate yourself on product features and capabilities beforehand.